Many of these projects use familiar things like highlighters, laundry detergent and glow sticks in surprising new ways. When you make them, you’re making with photoluminescent materials that react to light in different ways. 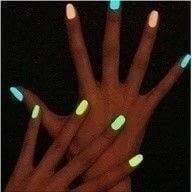 Two different types are fluorescence and phosphorescence – click here for a quick explanation and gallery of examples from Dr. Helmenstine at About.com. Making + chemistry = awesome projects. Stay calm and glow on, kid-makers! *SAFETY NOTE: While all of these projects can be done with kid-safe, non-toxic substances, ALWAYS check your labels to make sure that the highlighters or glow sticks you’re using are that kind. Never eat, drink or sniff chemicals of any kind, even if they are normal household chemicals. Stay safe and make on, kid-makers!